I was in Marks & Spencer’s and saw these lovely tins and thought “I must try these“. I bought 2 tins and then the following week I got another and after trying out some recipes I bought a 4th. 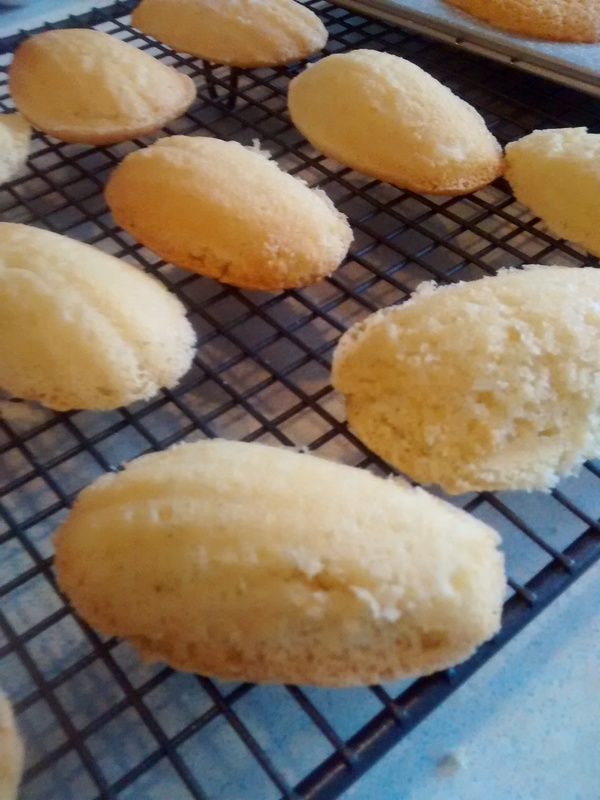 Madeleines are very small sponge cakes baked in tins with shell-shaped depressions. Of course you can make then in small bun tins if you want to see if you like them before investing in the tins. They originated from the Lorraine region in France. When looking for recipes I thought that these did not have a Polish connection but in fact they do! The exiled king of Poland, Stanisław Leszczyński (1677 – 1766), was the Duke of Lorraine from 1737 -1766 and his daughter Maria was married to Louis XV of France. Madeleine Paulmier was the cook for the exiled king and the story goes that these little cakes were named after her. Marcel Proust (1871 – 1922) the French author described them as “a little shell of a cake, so generously sensual beneath the piety of its stern pleating…” in his book À la recherche du temps perdu – In Search of Lost Time. I have tried out many different recipes all with varying quantities – my head was spinning trying to sort them all out. The following three are I ones I liked best. They are all based on variations of the Genoise Sponge in which you use melted butter. 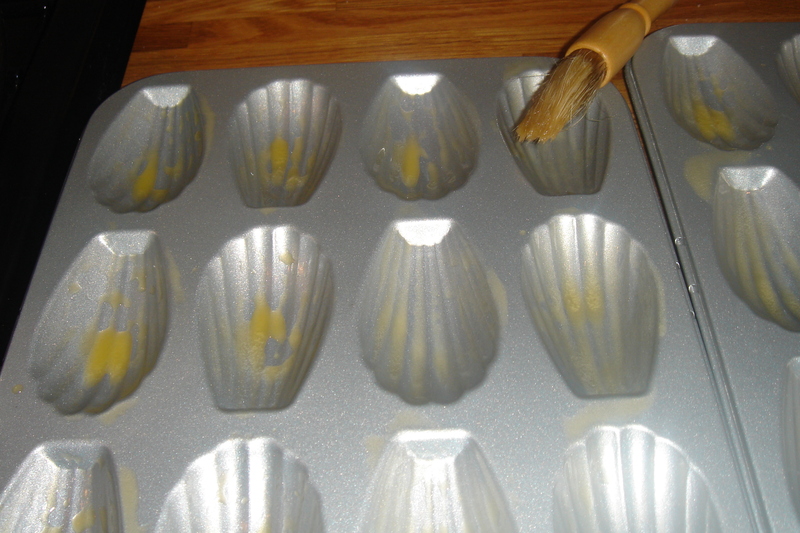 For ALL the recipes you must grease the tins well – I have found that using melted butter & a pastry brush is very effective. 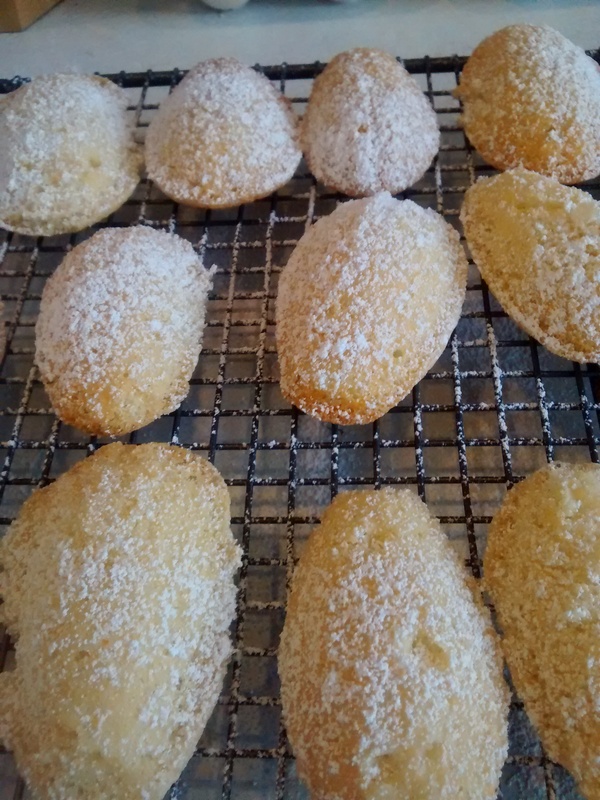 This mixture made over 30 Madeleines. In a small pan melt the butter and leave it to cool. Whisk the icing sugar, eggs and vanilla essence together until the mixture is thick and creamy. Gently fold in the self-raising flour using a metal spoon. Gently fold in the melted butter using a metal spoon. Bake for around 10minutes till golden. Leave them to cool slightly in the tins and then remove them onto a wire rack. 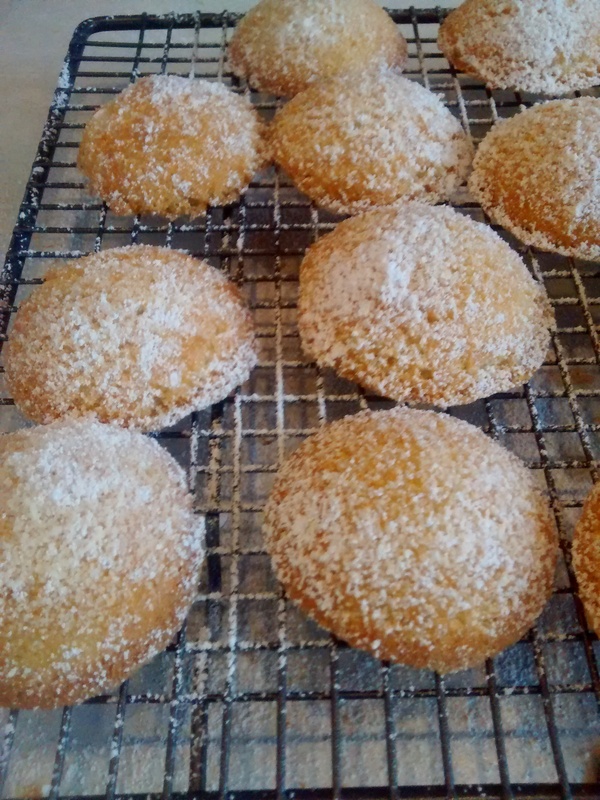 Dredge them liberally with icing sugar. 2-3 drops of vanilla or almond essence. 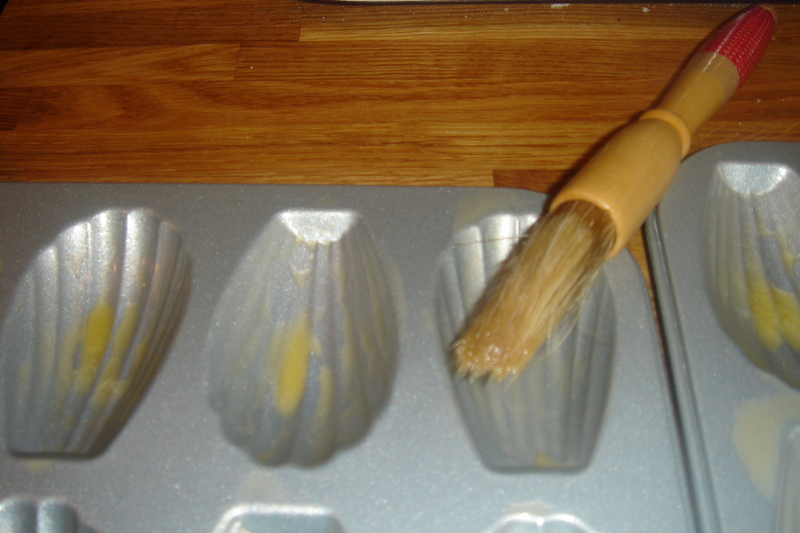 Whisk the icing sugar, eggs and vanilla or almond essence together until the mixture is thick and creamy. Mix the self-raising flour and ground almonds together. Gently fold in the flour and almond mixture using a metal spoon. 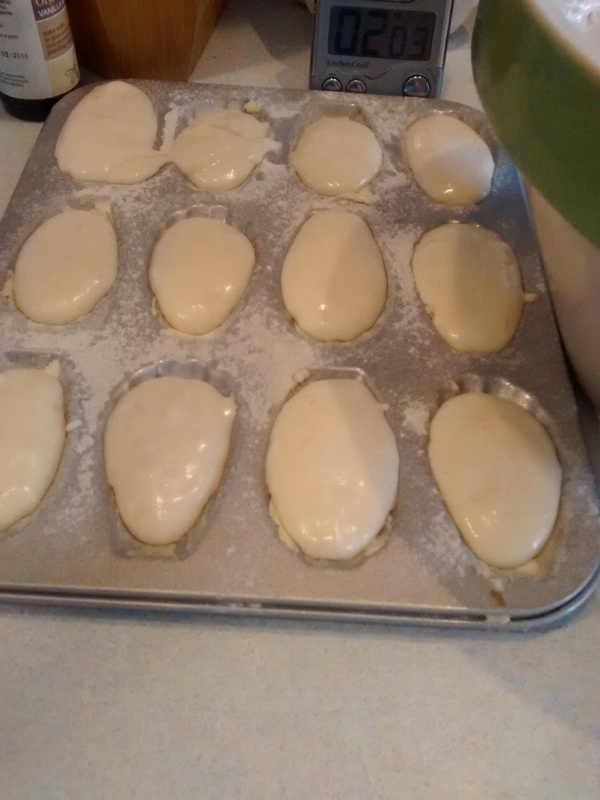 Divide the mixture between the pans. This recipe is based on a updated recipe from Mrs Beeton in How To Cook – 220 Classic Recipes For The Modern Kitchen – 2011. 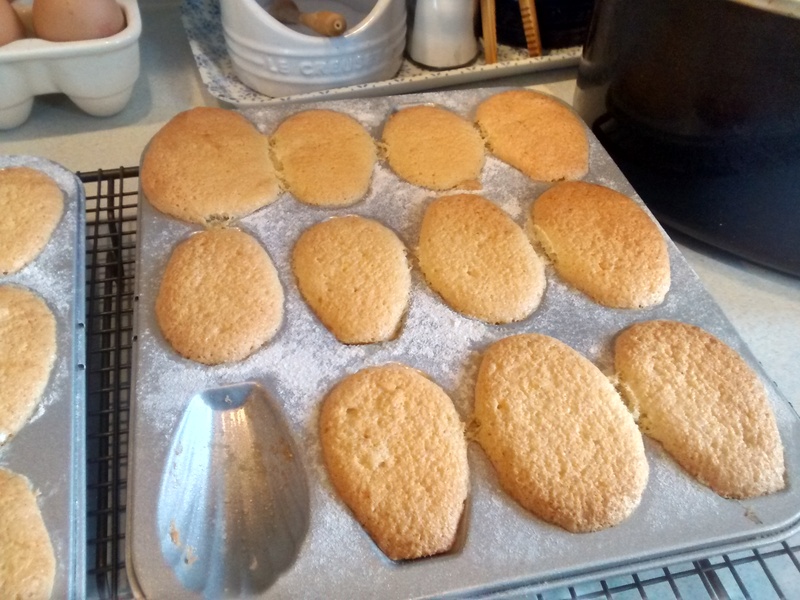 This mixture made 36 Madeleines. Place the butter in a small pan to melt over a medium-high heat and allow it to cook until it starts to brown lightly. Remove then pan from from the heat and add the honey and stir it in well. Leave the mixture to cool slightly. Whisk the icing sugar and eggs together until the mixture is thick and creamy. Gently fold in the cooled butter and honey mixture using a metal spoon until fully incorporated. Bake for around 10 minutes till golden. Keep an eye on them as the honey in them tends to brown quickly. Next Next post: Another Cheesecake!